Secretly, you’d love to know what it’s like, wouldn’t you? What it feels like for a girl. 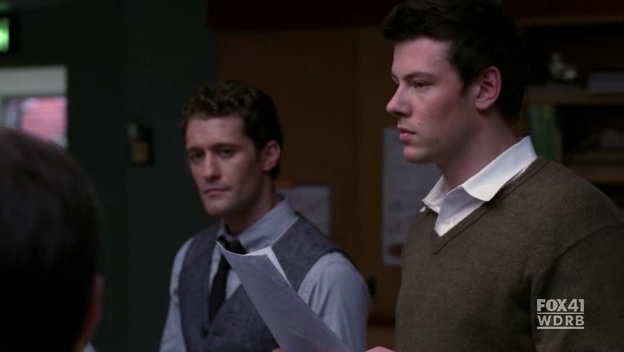 Mr Schuester gives him this thoughtful, lingering look. What’s he thinking? Is he wondering how often Kurt has wondered what it feels like for a girl — as opposed to the “honorary girl” he says he is. That’s what I’m thinking anyway. It’s one of my favorite moments in the whole show, in part because they just let it hang there. It’s really complicated and ambiguous. Glee usually messes up those moments by having someone talk about it. They don’t there, and it’s fantastic. I think it’s one of the first times that Kurt really reads like an adult to me, as opposed to a very competent child.